On our first date, Jordan and I went to Dave and Buster’s. We walked around picking out our favorite games and facing off for the first time. I was a decent athlete growing up, and have a pretty competitive spirit. I was not about to lose at a bunch of arcade games. After being defeated several times in a handful of different games, I sat down at the Speed of Light to collect Jordan’s tickets while he found another computer to conquer. The tickets didn’t stop coming out of the machine. Something like a thousand spit out at me. I had about enough. And he really did. At that time Jordan was 20-0 at the international level with one World Championship under his belt. He hadn’t lost a match in two years and was seemingly invincible on the mat. I think even he believed that. You have to. Because when you're trying to make history, you don't have time to stop to consider what happens if you lose. As much as I hated being crushed on that first date, it was the beginning of me understanding Jordan’s success. He truly believes in himself, even on the smallest of stages, playing the most meaningless games. He doesn’t just win, he loves winning, and he has fun doing it. Now being a winner doesn’t mean you never lose. On February 15, 2014 I was three months pregnant, sitting on my cousin Denise’s couch in Omaha watching Jordan wrestle at the Yasar Dogu International in Istanbul, Turkey. He was facing teammate Nick Marable. It was a tight match, but I remember being pretty relaxed as they entered the third period. Jordan always pulled it out. Then the clock ticked down and it started getting confusing. My video feed cut out and then came back on. Next thing I knew the referee was raising Marable’s hand. Denise was behind me, also fixated on my laptop screen. “Wait...what just happened?” she asked me, looking for reassurance. “I think he lost…” I replied, still in disbelief. I literally blinked and looked back at the screen to make sure I wasn’t dreaming. That’s how accustomed I was to my husband winning. Since we had known one another he had not lost a single match — or anything for that matter. He wrestled back to win bronze that day, smiling on the podium through the pain he was feeling. He saved those emotions for his phone call home. “But I really wanted to get to 100,” he said when I picked up the phone. He had won 69 straight matches. It was — still is — the longest win streak in American wrestling history, and here he was, typical Jordan, still thinking about winning more. I had to laugh. “You could’ve lost at 99,” I reminded him. Wives always have to bring you back to earth. Since that Marable match, Jordan has experienced loss on the mat a few more times. As a wife I could sit here and give you a list of reasons as to why each one of those losses should not have happened. I’d place blame elsewhere and not on my husband, because hey, that’s my job. Over the last four years I’ve watched in awe of how gracefully and humbly Jordan has handled defeat each time it has happened. In his mind, there’s never an excuse. But while there’s no excuse, there is always a response. Each loss, and especially the most recent at the 2016 Olympics in Rio de Janeiro, has been met with an intense desire to get better, a continued dream to make history, and a renewing of that unbeatable spirit like the scrappy kid from Sicklerville I first battled at Dave and Buster’s. Jordan has learned that he’s human. And there’s a beauty in that. It makes him vulnerable, but it also makes him relatable to the little lightweight tying up his JB Elites. He’s been blessed with gifts to inspire thousands. 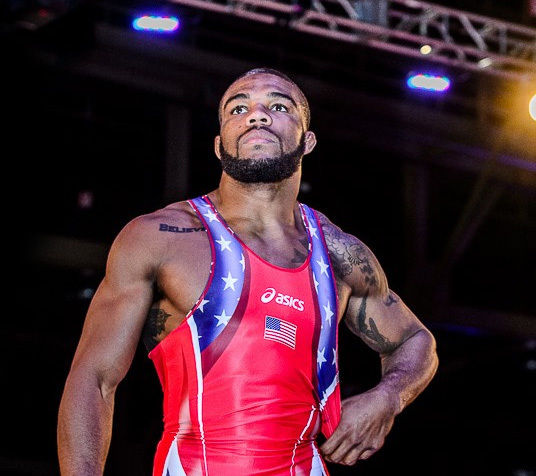 People all around this world stand to watch when he takes the mat — and I’m no exception. The feelings of anticipation starts to creep up in my stomach as I travel to each competition. Tonight they’re currently arising at somewhere around 35,000 feet over the Atlantic Ocean. I’m on United flight 57 to Paris, elated to be there as my husband writes a little more of his story these next few days. Regardless the outcome, it’s going to be quite a day. Come Saturday night, I am sure to be greeted by three things: a big sweaty hug, a request for donuts and a few more head wounds to tend to. I can only hope there’s a beautiful comeback story to go along with them.